The primary election season is close to finished. Nearly all of the November midterm match-ups are set. For the first time since Donald Trump’s election, voters in Iowa, Nevada, South Carolina and New Hampshire — the four critical early presidential states — have spoken in statewide and congressional elections, offering a glimpse into what the massive Democratic presidential field can expect in the 2020 primaries. What are the lessons of the 2018 early-state primaries? Democrats are sick of losing. In statewide contests, they didn’t back hardline Bernie Sanders or Hillary Clinton-aligned candidates so much as candidates who had a message they care about and a solid campaign operation. Even typically left-leaning Iowa Democrats ushered in a more centrist candidate who seemed best positioned to win in a general election. And in each of the gubernatorial contests in these states, old-school campaign tactics still seemed to work — the Democrat who spent the most on TV messaging was the victor. Across the early states, there were only scattered signs that insurgent forces within the Democratic Party were in the driver’s seat. Old-fashioned clout mattered. Harry Reid-backed candidates won in Nevada, and the New Hampshire party establishment dominated in Tuesday’s primary there. In New Hampshire’s two most closely watched races, establishment-backed gubernatorial candidate Molly Kelly captured the Democratic nomination along with Chris Pappas, whose insider support allowed him to easily cruise past 10 challengers in the open 1st Congressional District — including Levi Sanders, the son of the Vermont senator. Democrats have been gasping for air in this red state, and are in desperate need of resources to build up their ground game. So if you’re a big-name Democrat hoping to establish a presence in South Carolina, you better ante up. Republicans have had a lock on the governor’s mansion for two decades and this year’s primary was a reminder why: GOP voters cast more than 100,000 more ballots in the gubernatorial race than Democrats did. South Carolina Democratic Party Chairman Trav Robertson is explicit in his call for more national party resources to come his way so he can build up a 2020 field organization. “We can talk about a blue wave. We can talk about revitalizing the party, but if we don’t put a good structure in place, it’s all for naught,” Robertson said. He put the onus squarely on potential 2020 contenders like Los Angeles Mayor Eric Garcetti and Sen. Elizabeth Warren, who recently cut checks to the state party in their efforts to get acquainted. “Our hope is they will help us build the organization that propels one of them to win the nomination or to win our state,” Robertson said. The 2020 field is sizing up to have a historically large field of women, possibly including the likes of Sens. Kirsten Gillibrand, Kamala Harris and Warren. They would be building off the momentum of the 2018 elections, which are almost certain to produce record gains for women candidates in November. And nowhere was that trend more obvious than in Iowa and Nevada — particularly in Democratic congressional contests in those states. In Nevada, Congresswoman Jacky Rosen is the Democratic nominee for Senate while Susie Lee is the Democratic nominee to replace her in the House. In Iowa, Abby Finkenauer and Cindy Axne made it through contested primaries to become Democratic nominees in two of the most competitive congressional races in the nation. In early-state primaries this year, it isn’t just that women candidates are winning, more are primed to vote. There are more women registered to vote than men — as high as 14 percent more in some cases — in every state legislative district in South Carolina, according to the state Democratic Party. That disparity isn’t expected to change in 2020. And it’s all the more reason for candidates to make sure they’re not just delivering fiery rhetoric but digging into issues women care about: jobs, access to health care, education among them. While the Iowa Democratic base is notoriously left-leaning, this year’s primaries suggested rank-and-file Democrats are willing to concede on a few things to win in November. That’s good news for the more centrist-oriented 2020 Democratic contenders. This is an electorate that’s tired of losing: Republicans dominate both legislative chambers, the governor’s mansion and both U.S. Senate seats. Topping it off, Trump won their state in 2016. 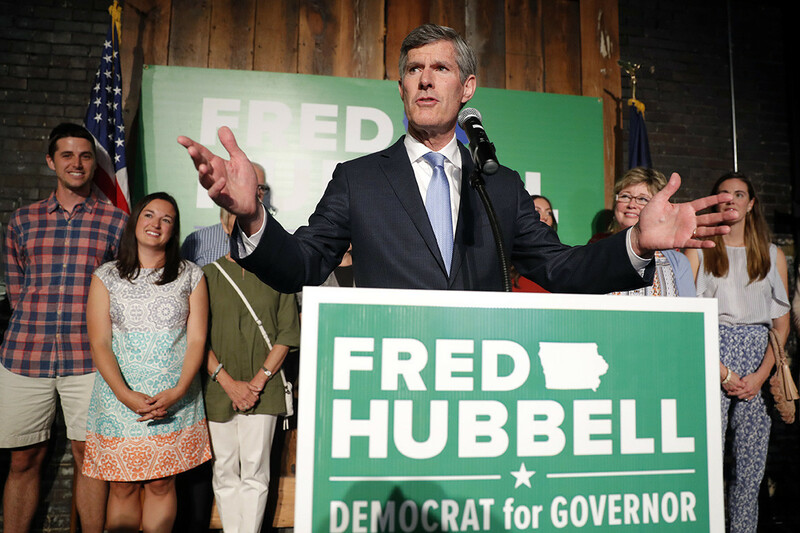 That frustration was perhaps reflected in the nomination of a moderate gubernatorial candidate, Fred Hubbell, who topped a Bernie Sanders-aligned candidate. And in the 3rd Congressional District, the more moderate Axne drubbed Sanders’ campaign adviser Pete D’Allesandro. Far from a firebrand, Hubbell relied less on soaring rhetoric and stuck to local issues, like Medicaid privatization. Political insiders say Hubbell best portrayed himself as someone who could carry a winning statewide message. “Democratic primary voters are looking for candidates who can win and are talking about the issues that matter to them,” said Democratic Governors Association spokesman Jared Leopold. In the early states, one of the oldest rules in politics applied: success follows the best-run campaigns. Disciplined candidates who refrained from single-issue Trump-bashing and addressed specific issues thrived. Fundraising also played a key role. While campaign spending didn’t necessarily translate into wins in all contests across the country, it definitely helped in these four states. In each of the early state gubernatorial contests, the Democrat who won the gubernatorial primary spent more money than their opponents on TV ads. In Nevada, for example, businessman Steve Sisolak spent $ 5.1 million on TV advertising to Chris Giunchigliani’s $ 3.8 million. In Iowa, Hubbell far outspent his opponents on TV, posting $ 3.1 million in ads, more than his four opponents combined (including Nate Boulton who dropped out late in the race amid sexual misconduct allegations). If Democrats want to reclaim their state from Trump in places like Iowa, the ballot’s got to be chock full of competitive races. Iowa Democrats know they must contend with fewer voters statewide than Republicans. So to boost turnout, they’ve worked to contest more state and local races than they have in a generation. It’s a strategy they believe resulted in a surge of Democratic votes in their June primary. In South Carolina, Democrats say to have any hope of making their state competitive in the general election, fielding down ballot candidates is essential. This year, for example, Republicans fielded candidates in at least 40 more down ballot races than Democrats. In both Nevada and New Hampshire, Democratic establishment clout revealed itself in several highly contested races. After top party officials went all-in for gubernatorial candidate Molly Kelly, she won the nomination with 66 percent of the vote, trouncing former Portsmouth Mayor Steve Marchand. There was perhaps no better illustration of New Hampshire Democratic establishment muscle than in the 1st Congressional District primary. In that contest, state Executive Council member Chris Pappas easily emerged as the winner, beating out 10 other candidates. That was after a fierce threat put up by military veteran Maura Sullivan, an appointee of former President Obama who outspent Pappas 2-to-1. In Nevada, there was a similar phenomenon. Harry Reid’s grip on politics, even after his retirement from the Senate, remains notable. Even in the so-called year of the woman in politics, the former Senate leader publicly backed Sisolak in the governor’s race against Giunchigliani, believing Sisolak was better positioned to win a general election. Privately, Reid even played a role in steering donors to Sisolak. That wasn’t all: In the state’s two open House races, the eventual Democratic nominees carried Reid’s blessing.